Questions? Speak with us Toll-Free at 1-800-645-4710 or send us E-Mail. Over the years, I have seen many chess sets. Most are rather ... generic and purely functional. It is rare you find a set of chessmen that explore a level of artistry that is considerable. We deal with many manufacturers from all over the globe, but most wooden sets are manufactured in India. The general quality of chess sets exported by this country are of the generic and functional type. 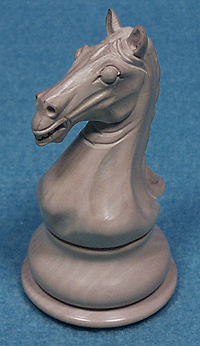 Many aficionados of finer chessmen complain that the Indian produced sets are "always" of a poor quality. I have learned this is not always the case. There are always exceptions to the rules. In the beginning of the year, one of our manufacturers informed us that they had produced a very high quality, ebony set that rivals some of the finest made. My reaction was, "Umm...OK...sure. I'll take a look at it at the Toy Fair in New York in February". I'm not easily impressed these days. I went to the fair and low and behold there was this manufacturer with this pretty staunton set. When I got up close, I began to realize the true quality of this set of chessmen. The finish gleamed, the ebony was an absolute pitch black, the proportions of the pieces seemed perfect to me. But it was the Knights that really caught my eye. They were absolutely gorgeous. For the first time, a knight that actually looks like a real horse's head. Not some weird interpretation of a horse, but a real miniature still life "sculpture" of a horse's head. It was outstanding. We decided to purchase many of these for this reason, and others, which I will outline in detail below. We have been trying to think of a special name for this set. Legend Products has its "Pioneer Elite" and the Mark of Westminster has it "Super Grand Series", and the ever wonderful House of Staunton has it's amazing "Millenium Series". But this set is not from a brand name maker. So we simply refer to it as "Special Classic Staunton". Not very original, and it doesn't evoke a sense of wonder like the other names do. But this set is "special", follows "classic" lines for a sculptured set, and follows the traditional detail of the "Staunton" Pattern. The name fits, albeit modestly. The pieces are hand carved from single pieces of ebony and boxwood. 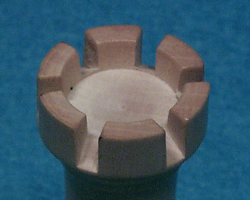 It is typical to make some chess pieces from several pieces of wood that are glued together. This is most common in the knights, here the horses head part is carved, then mounted onto a base. This makes it easier to carve the knight by hand. It also is a less expensive method. Knights, being hand carved, have a high rejection rate due to slips of the hand during carving. If you are carving only the top part of the piece then you save more wood when you have these rejects. When you produce several thousand knights a month, that can add up to quite a bit of exotic timber. And exotic timber is exactly what this set is made from. Yet, they still made each chesspiece from a single piece of boxwood or ebony, in complete defiance of the cost. This ebony, by the way, is absolutely pitch black. Some of the darkest ebony I have ever seen in a Indian produced set. The boxwood is creamy and shows deep figure and luster. The set is richly finished. Hand buffed and rubbed lacquer finishes of this quality are very rare out of India, so this set ranks as one of the best. The luster is outstanding; it is deep and hard. 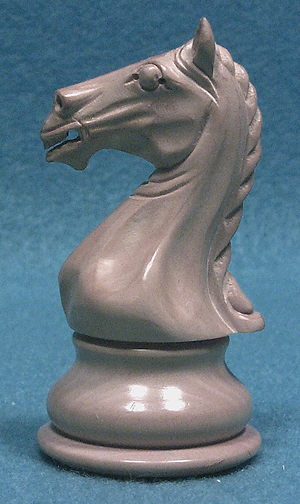 You can see on the image of this beautiful knight, the luster of this finish on the boxwood at the base. They shine but are not high gloss, instead a smooth warm satin finish is presented. Some of the other details that make this set outstanding are subtle, but when combined give this set its high marks for attention to detail and general high level of artistry. There is a consistent concave curvature in each of the pieces. It is expressed in all of the pieces without exclusion. This is atypical for nearly all other sets I have seen, particularly when one compares the rooks. This consistency in general design, from king to pawn, is another aspect that give this set high marks on my list. You can notice this on the image at the top of this review. In addition, the relative heights is consistent, and correctly progressive. 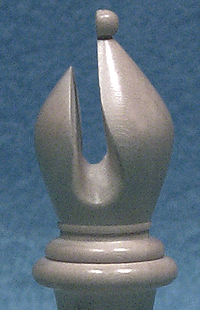 You could almost take a ruler and place it on the top of the king's delicate finial, an there is a straight nearly linear slope down towards the pawn. Another nice detail I personally love is the very wide hand worked miter cut in the bishops. As you can see in the image to the left the cut is not just a straight saw cut, but also involves a hand reamed widening and rounding at its base. The cut itself is wide and smoothed by hand. This type of wide cut miter is becoming the fashion in chess sets, even though it doesn't represent the original Staunton pattern. I think it makes a bishop chesspiece look much more like the garment worn by its namesake. The rooks have also been given special attention. The castellations on the top of most rooks are usually achieved by cutting across the turret three times, like cutting a pie. This leaves six castellated battlements with flat bottoms which lie parallel to the chessboard. This is not accurate to true castellations found on real fortifications. Usually, the castellations slope downward towards the ground, leading away from the turrets. This is done to increase the line of sight downward and afford the defending forces a clear view of what is below them without leaning over the battlement, making them vunerable to arrows or other siege weaponry. A wonderful detail on this set is the extra step in carving to accomplish this sloping detail. This detail is rarely seen on most castellated turrets on rooks in chessmen sets. The attention to detail even goes as far as the very bottoms of the pieces. The maker of this set choose to place black leather on the bottoms of this set. And it was done purely for esthetic effect. Notice in the image to the left how the underside tapers inward at the broad base. The leather is undercut so as to not take away from this inward taper when it sits on the chessboard. In fact this undercutting accentuates this taper. They choose leather because of it thiness. A felt bottom would be nearly three times as thick. This would break the flow of the taper, and take away from this detail. The leather is thin and help maintain the integrity of the tapering. This leads me to mention the very broad bases on these pieces and how they are executed. The wide bases complete the concave contour mentioned earlier, in fact, they resolve this line down to the chessboard. It is done in way so the pieces have a broad base, but also, by following this line gracefully it doesn't make the pieces seem overtly "squat". The lines are elegantly resolved to a very broad and stable base. This broad base also accomodates the ability to allow for very heavy weighting of this set of chessmen. The set is one of the heavier chessmen sets I have seen in this size category. Later in this review we will give a chart showing the dimensions and weights for all the pieces in this set. It is enough to say, at this point, that this set is indeed quite hefty! Now we shall get into it! King 4" 1.7" 3.8 oz. Queen 3.3" 1.6" 3 oz. Bishop 2.9" 1.5" 2.5 oz. Knight 2.7" 1.4" 2.1 oz. Rook 2.4" 1.4" 2 oz. Pawn 2.2" 1.3" 1.5 oz. As you can see, this set is hefty and has very desirable proportions. I tend to think this set works great on Mahogany or Walnut chessboards with playing squares measuring 2.25" to 2.5", and furthermore any large storage box is recommended since it only comes in a cardboard box. In that regard it is packaged very well. The pieces are individually "zip lock" bagged in most cases. Soft, hairlike protective fibers gently protect each piece. This set will ship very well with no chance of damage. There many people out there who complain, downplay, or take no account of chessmen made in India. They cite poor quality as their primary reason to be taciturn or even indifferent. But if one looks deeper, one will find mostly this is a simple case of bias. We all create favorites in our mind and tend to excuse all others by convincing ourselves we chose the best. We justify our choice by excluding all others. Hey ... it's normal. But there are times where clarity breaks through and allows one to open their eyes and understand the real truth. In this case its that one should not generalize. This set (and others) from India disprove the notion that high quality is not attainable from that region. This set has all the keynotes one would desire in a high quality set, and I have one sitting gloriously on my dining room table as I write this! My eyes are wide open. Want to buy it now? ... Click Here.